Sure, everyone has cravings….but I’ve been plagued with the unattainable kind as of late. Everything I want is either far away or just plain gone. 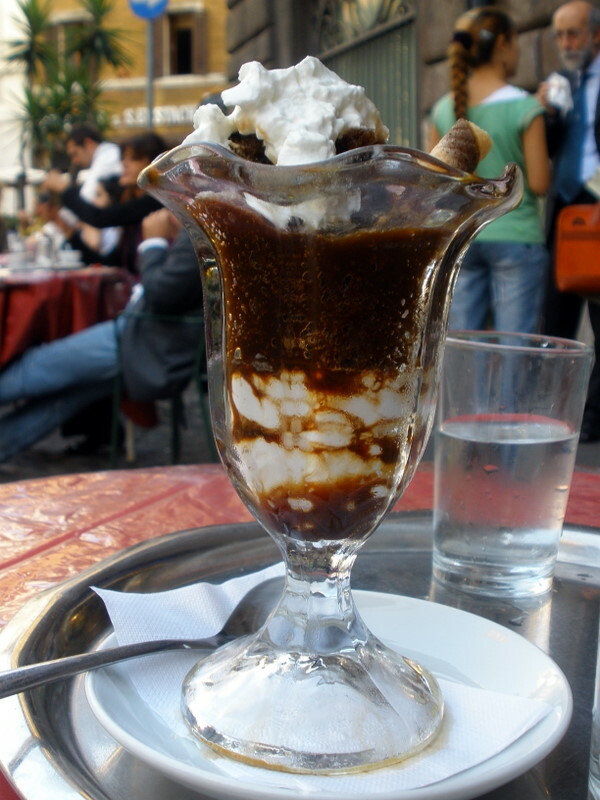 What I really want is a coffee granita with cream from Sant’Eustachio in Rome (pictured, but slightly too far away for an afternoon coffee break), or a croque monsieur from Tartine Bakery (San Francisco’s Mission District is more than a lunch break’s drive away), or the seafood stuffed flounder from Brunings at West End (gone since Katrina), or some thin cut, crispy onion rings from Shane’s (which burned down years ago). Still, I can have a few bites of edible nostalgia right in the heart of Uptown New Orleans, though. Yesterday, Hansen’s Sno Bliz opened for its 74th season. The sno-blizzes are flowing freely from Mr. Ernest’s machine; hours are 1 pm to 7 pm, Tuesday through Sunday. Hansen’s now does offsite catering–so if the long wait for a sno-bliz seems unsurmountable, Hansen’s can come directly to you. I know what I plan to do if I win the PowerBall tonight…….hit all of those far-away cravings and hire Hansen’s to cater my “bon voyage” party!